This example shows how to minimize Rastrigin’s function with six solvers. Each solver has its own characteristics. The characteristics lead to different solutions and run times. The results, examined in Compare Syntax and Solutions, can help you choose an appropriate solver for your own problems. Usually you don't know the location of the global minimum of your objective function. To show how the solvers look for a global solution, this example starts all the solvers around the point [20,30], which is far from the global minimum. The rastriginsfcn.m file implements Rastrigin’s function. This file comes with Global Optimization Toolbox software. 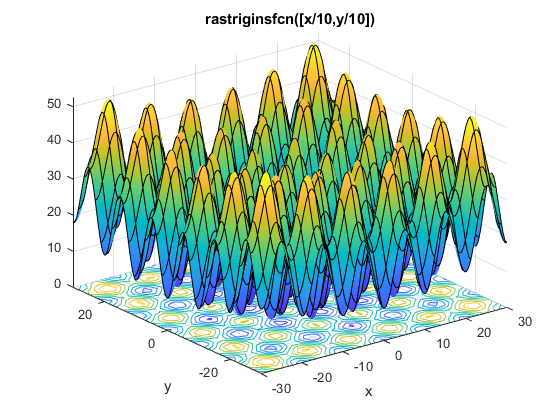 This example employs a scaled version of Rastrigin’s function with larger basins of attraction. For information, see Basins of Attraction. This example minimizes rf2 using the default settings of fminunc (an Optimization Toolbox™ solver), patternsearch, and GlobalSearch. The example also uses ga and particleswarm with nondefault options to start with an initial population around the point [20,30]. Because surrogateopt requires finite bounds, the example uses surrogateopt with lower bounds of -70 and upper bounds of 130 in each variable. less than the default value of the function tolerance. xf is the minimizing point. ff is the value of the objective, rf2, at xf. flf is the exit flag. An exit flag of 1 indicates xf is a local minimum. of is the output structure, which describes the fminunc calculations leading to the solution. xp is the minimizing point. fp is the value of the objective, rf2, at xp. flp is the exit flag. An exit flag of 1 indicates xp is a local minimum. op is the output structure, which describes the patternsearch calculations leading to the solution. initpop is a 20-by-2 matrix. Each row of initpop has mean [10,30], and each element is normally distributed with standard deviation 10. The rows of initpop form an initial population matrix for the ga solver. opts is the options that set initpop as the initial population. The final line calls ga, using the options. xga is the minimizing point. fga is the value of the objective, rf2, at xga. flga is the exit flag. An exit flag of 1 indicates xga is a local minimum. oga is the output structure, which describes the ga calculations leading to the solution. Like ga, particleswarm is a population-based algorithm. So for a fair comparison of solvers, initialize the particle swarm to the same population as ga.
xpso is the minimizing point. fpso is the value of the objective, rf2, at xpso. flgpso is the exit flag. An exit flag of 1 indicates xpso is a local minimum. opso is the output structure, which describes the particleswarm calculations leading to the solution. surrogateopt does not require a start point, but does require finite bounds. Set bounds of –70 to 130 in each component. To have the same sort of output as the other solvers, disable the default plot function. xsur is the minimizing point. fsur is the value of the objective, rf2, at xsur. flgsur is the exit flag. An exit flag of 0 indicates that surrogateopt halted because it ran out of function evaluations or time. osur is the output structure, which describes the surrogateopt calculations leading to the solution. problem is an optimization problem structure. problem specifies the fmincon solver, the rf2 objective function, and x0=[20,30]. For more information on using createOptimProblem, see Create Problem Structure. You must specify fmincon as the solver for GlobalSearch, even for unconstrained problems. gs is a default GlobalSearch object. The object contains options for solving the problem. Calling run(gs,problem) runs problem from multiple start points. The start points are random, so the following result is also random. GlobalSearch stopped because it analyzed all the trial points. All 4 local solver runs converged with a positive local solver exit flag. xg is the minimizing point. fg is the value of the objective, rf2, at xg. flg is the exit flag. An exit flag of 1 indicates all fmincon runs converged properly. og is the output structure, which describes the GlobalSearch calculations leading to the solution. One solution is better than another if its objective function value is smaller than the other. The following table summarizes the results, accurate to one decimal. fminunc quickly reaches the local solution within its starting basin, but does not explore outside this basin at all. fminunc has a simple calling syntax. patternsearch takes more function evaluations than fminunc, and searches through several basins, arriving at a better solution than fminunc. The patternsearch calling syntax is the same as that of fminunc. ga takes many more function evaluations than patternsearch. By chance it arrived at a better solution. In this case, ga found a point near the global optimum. ga is stochastic, so its results change with every run. ga has a simple calling syntax, but there are extra steps to have an initial population near [20,30]. particleswarm takes fewer function evaluations than ga, but more than patternsearch. In this case, particleswarm found the global optimum. particleswarm is stochastic, so its results change with every run. particleswarm has a simple calling syntax, but there are extra steps to have an initial population near [20,30]. surrogateopt stops when it reaches a function evaluation limit, which by default is 200 for a two-variable problem. surrogateopt has a simple calling syntax, but requires finite bounds. Although surrogateopt attempts to find a global solution, in this case the returned solution is not the global solution. Each function evaluation in surrogateopt takes a longer time than in most other solvers, because surrogateopt performs many auxiliary computations as part of its algorithm. GlobalSearch run takes the same order of magnitude of function evaluations as ga and particleswarm, searches many basins, and arrives at a good solution. In this case, GlobalSearch found the global optimum. Setting up GlobalSearch is more involved than setting up the other solvers. As the example shows, before calling GlobalSearch, you must create both a GlobalSearch object (gs in the example), and a problem structure (problem). Then, you call the run method with gs and problem. For more details on how to run GlobalSearch, see Workflow for GlobalSearch and MultiStart.